A great new style of cushion for your singing bowl to sit upon. Handmade in Nepal, these beautiful red ring pillows are the perfect resting place for your 5-7 inch singing bowl. Cushion is made of polyester and features a golden dragon brocade design. 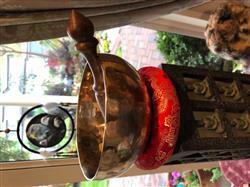 The singing bowl ring cushion allows the bowl to sing loud and clear! It blends in with the decor, as well! Singind bowl ring, a must have! Hello Denise, thank you for your feedback! We are so happy to hear you are enjoying your cushion, and love that you shared this photo with us! Thank you again for taking the time to write this review, and we appreciate you supporting Himalayan artisans!